Asombro is on the move. This spring, Asombro staff and volunteers have been heading 60 miles due west to Deming in order to bring hands-on science education to K-12 students in Deming Public Schools. All this is possible because of a generous grant from the PNM Resources Foundation to the Asombro Institute. The Foundation is dedicated to improving the quality of life in New Mexico. And we are too! So, what does this grant actually mean? First grade students investigate a scorpion during the lesson, Young Arthropod Identification. With just two months left in the school year, we have been busy. Kindergarteners have explored different surfaces in the sun and shade and created a new home for Lizza the Lizard; 1st graders have matched young arthropods to their adult counterparts; 2nd graders have investigated arthropod diversity in their schoolyard; 3rd graders have discovered patterns in the life cycles of various desert organisms; 4th graders have created arguments about the necessity of plant structures to plant survival; and 5th graders have mixed matter to identify mystery substances by their properties. Deming Public Schools middle school science teachers work through an Asombro lesson on energy to better understand NGSS alignment. 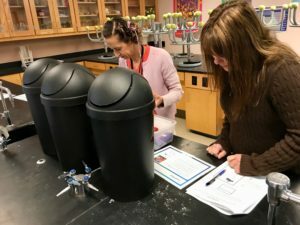 In March, Asombro staff held a workshop on the Next Generation Science Standards (NGSS) for middle school science teachers in Deming. Through exploring Asombro’s lesson, Energy Transfers Around a Kangaroo Rat in the Desert, the educators learned how three dimensions of the NGSS work together, how to read the standards, and how to apply NGSS in their classroom. All the teachers reported gains in their knowledge and confidence in using the new science standards from our half-day workshop. 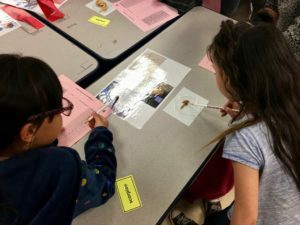 We were thrilled to be able to give them the knowledge, confidence, and tools (like our NGSS wheels of science and engineering practices) to help make this transition. April and May are filled with trips to Deming. The early mornings are made sweeter by beautiful sunrises and engaging lessons with enthusiastic students and teachers. 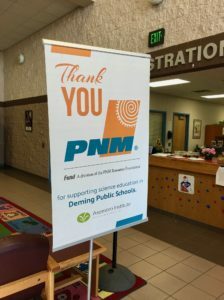 Asombro has been having a wonderful time in Deming thanks to PNM Resources Foundation – we can’t wait to hit the road again! Rachel is a Science Education Specialist at Asombro. She was thrilled to help lead the NGSS-workshop in Deming. 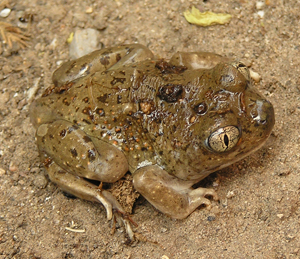 A unique characteristic of a true spadefoot toad is the vertical pupil of the eye. While it may seem strange to have amphibians in an arid habitat, there are several amphibians found in this region of the Chihuahuan Desert. One such animal is the spadefoot toad. These animals spend most of their lives underground estivating (living underground in a state of dormancy). When heavy rains arrive, they dig to the surface to feed and reproduce quickly before surface water evaporates. A sharp-edged black tubercle (“spade”) on a toe of each hind foot helps them dig in the soil. 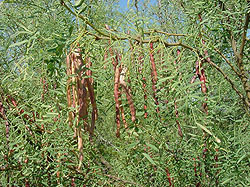 Honey mesquite beans hanging in bunches. The honey mesquite is found from California to Kansas and south to Nuevo Leon, Mexico. This winter deciduous legume has nitrogen-fixing bacteria associated with its roots. Shed leaves have a high nitrogen content that fertilizes the soil under the plant when the leaves decompose. Mesquite may serve as a “nurse plant,” especially for plants that require nitrogen-rich soils. Plants such as the desert holly (Acourtia nana) are common under the canopies of honey mesquite. Mesquite taproots are commonly 40 feet (12 m) deep or longer. Long lateral roots are common on plants growing above a cemented calcium carbonate (caliche) soil layer. There are large thorns on the honey mesquite; many animals burrow under the mesquite to benefit from the protection offered by the thorns. Mesquite produces edible pods that are rich in carbohydrates and protein. The seeds and seed pods are collected by several species of large ants, kangaroo rats, and wood rats. Native Americans and early Spanish settlers ground these pods into a flour that was used for making breads and cakes. This hill (right) is the eroded remnant of a volcano that formed about 45 million years ago. The lava flows and mudflows that resulted from this volcano are collectively called the Palm Park Formation. The dark gray angular rocks in the hill are andesite. This volcano (left) was active approximately 35 million years ago. After erupting, the remaining dense magma intruded into cracks in the earlier Palm Park lava. Over time, the surrounding softer rock weathered, eroded, and washed away, leaving a volcanic dike, a linear projection of hard rock seen in the photo above. 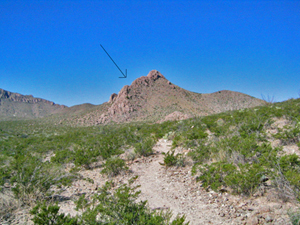 This dike is Doña Ana monzonite, a type of granite. Honey pot ants are known for their ability to store large amounts of nutritious liquid in their body. 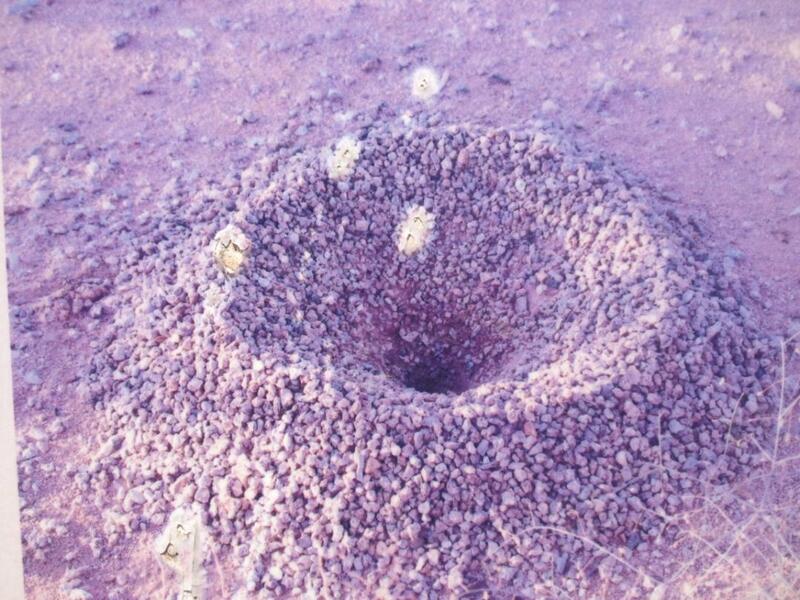 These ants will feed off the sugary nectar of desert flowers after a rain. Specific ants, known as repletes, will be engorged with this nutritious liquid by other worker ants. Repletes store food for the colony, as they hang from the ceiling of their underground nests. They remain engorged until the dry season when their reserve food supply is needed. Due to the nutritional value of honey pot ants, many other animals look to prey on honey pot ants for additional food and liquids. This includes other invertebrates, animals and even humans! 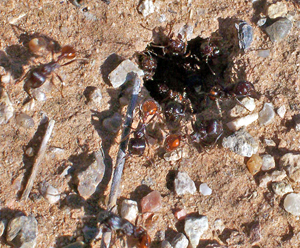 Harvester ant nests can be several feet down and are clear of vegetation at their entrance. These harvester ants live in colonies with up to a thousand workers. They collect seeds that are subsequently stored in the nest to feed the larvae. They also collect termites and other insects whenever these are available. Harvester ants have a potent sting. In fact, for mammals, the harvester ant’s venom is ten times more toxic than a rattlesnake’s venom. Fortunately, the dose carried by a single ant is small, so one sting is painful but not medically significant. Multiple stings, or the rare case of an allergic reaction to the venom, should be taken seriously. Bite marks from jackrabbits are evident on prickly pear cactus. 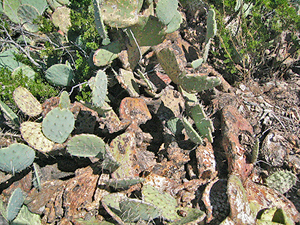 Prickly pear cactus can be found with large bite marks. Prickly pear is an important resource for many animals because of its high water and nutrient content. 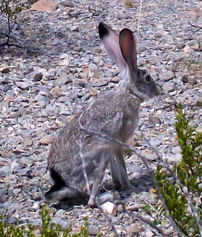 During winter, black-tailed jackrabbits and desert cottontail rabbits eat the pads, somehow avoiding the spines or biting the spines from the pads. Packrats feed on prickly pear by peeling the surface layer off the prickly pear pads. During the winter months, rodents and rabbits frequently dig near the base of prickly pear in order to eat the roots. In most cases, the animals do not eat all of the pads, and the cactus produces new pads in the spring and early summer. Pads that fall off can sprout roots from any place the areoles (where spines are attached) touch the soil. Kangaroo rats get their name from their jumping ability, which resembles that of kangaroos. Kangaroo rats are true desert specialists; due to many water-saving strategies and physical structures, a kangaroo rat could live its entire life without ever drinking a drop of water! Kangaroo rats spend the daylight hours in burrows where relative humidity is very high and temperatures are moderate (around 80°F). They emerge to feed on seeds at dusk and at dawn. 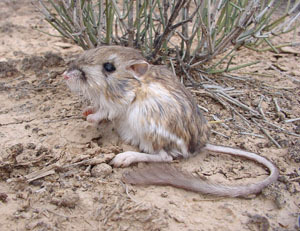 A modified kidney allows the kangaroo rat to concentrate its urine, thus reducing water loss. Special nasal passages further minimize water loss as a kangaroo rat breathes. 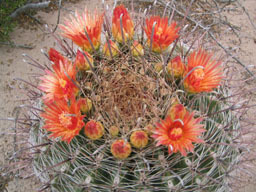 The orange-yellow flowers of the barrel cactus start to appear in July through September. The fishhook barrel cactus is one of the largest barrel cactus species in North America. It is found in desert grassland and desert shrub habitats of the Sonoran and Chihuahuan Deserts. The frost-sensitive species is usually solitary but sometimes branches into multiple stems. It generally has a life span of 50 to 130 years. The accordion-type pleating (or ribs) of the stem allows the barrel cactus to expand and store water after brief periods of heavy downpours. The absorbed water is stored in the form of a slimy alkaline fluid, so contrary to popular myth, it is not readily available for drinking. Yellow to reddish flowers generally peak from July through September, and the yellow fruits can remain on the plant for up to a year. The apex of the barrel cactus sometimes leans to the southwest where heat is the strongest. This allows strong sunlight to hit the top of the plant where dense spination shades the growing stem. Seeds are dispersed by birds and rodents. Native Americans used barrel cactus pulp to make candy and jelly. The flowers were used to create a yellowish pigment, and the hooked central spines were used as fishhooks. Jackrabbits feed on plants such as perennial flowers and grasses. Jackrabbits are not rabbits but hares. Their long ears provide a large surface area for dissipating body heat to the environment. They rest in the shade during the heat of the day. If the shade is even slightly cooler than their body temperature, they can find relief from the heat. Hares also differ from cottontail rabbits in birthing their young. While cottontails dig burrows and give birth underground to helpless, blind babies, hares scratch out a shallow depression and give birth above ground. Their babies are born with their eyes open and are ready to leave the nest in a matter of hours. Tarbush has characteristic black stems that make it recognizable. 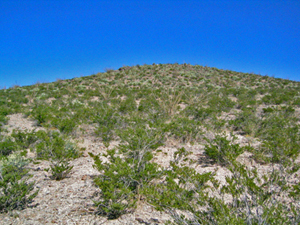 Tarbush is found only in the Chihuahuan Desert; it is a Chihuahuan Desert endemic. It is a partially winter deciduous shrub (it sheds all leaves in some winters and retains some leaves in other winters). It will remain leafless into the summer months until there is adequate soil moisture. This deep-rooted shrub gets its name from the resins in the leaves, which have a distinctive, tar-like odor. These resins keep most animals from feeding on the shrub. Scientists have discovered more than 100 chemical compounds in tarbush leaves. Some tarbush plants have more compounds than other, nearby tarbush plants. This may explain why animals chew on some plants and not others. Small, inconspicuous flower are produced on tarbush in late fall. In northern Mexico, tarbush leaves and flowers have been used to treat indigestion. The creosote bush gives off a sweet fragrance when it rains and deters animals from eating it. This evergreen shrub is characteristic of the Mojave, Sonoran, and Chihuahuan Deserts. The inverted cone shape of the shrub enhances the capture of rainfall as water runs down the stems and enters the soil at the plant’s base. Older shrubs develop a hemispherical shape and capture wind blown leaves and plant fragments that form a litter layer. As the litter decomposes, it produces a “fertile island” of nutrient-rich soil under the plant. Individual plants can be as old as several thousand years. In fact, clones of creosote bush may be the earth’s oldest living organisms. 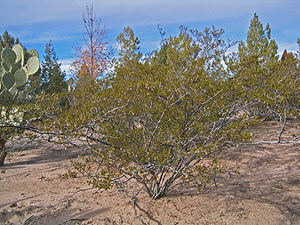 Creosote bush produces small yellow flowers and small, hair-covered fruits during the spring and late summer. 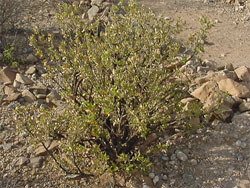 Creosote bush has been used in various remedies for arthritis and stomach pain.